HealthAid Black Garlic has double the nutrients than normal white garlic; richer in antioxidants and sweet in taste; leaving no unpleasant aftertaste or smell commonly associated with garlic. Garlic is a member of the onion, leek and chive family. It is known for its extremely powerful antioxidant activity and plays a vital role for general health and wellbeing. Bulking Agent (microcrystalline cellulose), Black Garlic Extract (allium sativum), Anti-caking Agent (silica, veg. magnesium stearate). Adults and children over 6 years of age: Take 1 vegicap daily with water after food. Adults: Can increase up to two vegicaps a day if required. Do not exceed recommended daily intake unless advised by a suitably qualified person. Below are reviews of HealthAid Black Garlic - 30 x 750mg Vegicaps by bodykind customers. If you have tried this product we'd love to hear what you think so please leave a review. 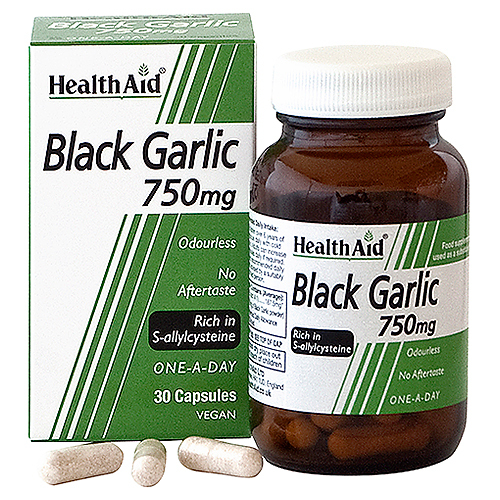 HealthAid Black Garlic has double the nutrients than normal white garlic; richer in antioxidants and sweet in taste; leaving no unpleasant aftertaste or smell commonly associated with garlic.